I wish I had a dime, well, maybe a dollar, for every time I got that strange look from someone that said, “YOU bow hunt”? My husband could quit his job, retire at 41, and we could buy a second home in Jamaica! I guess a 5”2, 110 lb. wife of 17 years and mother of two is not supposed to do such a thing as bow hunt. Okay, maybe 115lbs., who’s counting? To be honest I get their question and confusion, so as I begin to write the story on my greatest hunting experience to date, I will do my best to answer the baffled. My 2007 mule deer hunt actually started in 1989, the year I met the love of my life, my husband Marty. This man was everything I ever dreamed of and more. He did, however, have this one little obsession, that for the life of me I could not get my head around. The man lived to be outdoors. He actually got out of his mind excited to climb a tree and sit in it for hours at a time in 20 below wind chills to get a glimpse of a deer, to get out of bed at 3:30 am to break ice on the lake so the geese flying overhead could find open water. To practice for hours on end with a little device in his mouth so he could master sounding like a turkey, and so on and so on. To be honest, his passion seemed a little strange to me at the time. I did not grow up with any hunters in my family; in fact, I was pretty much confused with a man that would have so much respect for the animals he shoots. I was very uneducated about the whole hunting thing; I admit it. It took time and I was a slow learner. Thank God, Marty was a great teacher, and remained very patient with me in the early days of our blissfulness. I owe him so much for giving me the gift of seeing Gods country like I had never seen it before. It didn’t take me long, however, to realize that I could be a lonely wife at certain times of the year. I would be what they call a “hunters widow”, during hunting seasons. A few months out of the year, I could handle that, right? Well, it took an even shorter period of time to realize that hunting season tends to extend beyond just the legal months it’s okay to shoot. There is so much to do during the rest of the year. Don’t you know? You have to scout new ground, set up trail cameras, plant food plots, find big buck sign, pump water for the pond, fix generators, build tree stands, practice calling, go to 3-D shoots to keep your skills up, and so on and so on! I have to be honest and say in the beginning it got kind of annoying, and I was a little resentful at times and probably not a very good “hunters wife”. Marty would try and try to involve me, but I was never interested. Looking back, I feel like a very lucky girl, he tried so hard. Some men really don’t want their wives involved; too much fun with their “huntin’ buddies”, a girl might put a damper on things. But, he never gave up on me. The problem was I never gave it a chance. In spite of my bad attitude at times, about being a “hunter’s widow” we were madly in love with each other and did manage to get pregnant somewhere between turkey season and deer season. Maybe a baby would slow the hunting thing down a little? Maybe we would have a little girl, and we could do girly things when dad was out hunting. Oh, the lonely days were over for mama! We would go shopping and get our nails done; pink was my new favorite color for the next 9 months. Then it happened! The big day! A new beginning! A true blessing! A BOY! A SON! We had a BOY! April, 28th. 1992. That was one of the happiest days of my life. That was the special moment God gave me not only a son, but a new insight, a new outlook, a different perspective. When I looked at my husband holding our newborn son, I knew God had given us exactly what we needed, my husband was holding his new little huntin’ partner and the pride on his face is a look I will never forget. That was an awakening for me, I saw into the future, I saw dad and son leaving for hunting trips, making memories, bonding together, and I saw mom sitting at home waiting. That’s when I decided; if ya can’t beat ‘em, join em’! Looking back, I’m so thankful to have had an epiphany that day, because on December 15, 1993 our second son came along. And so it began…. Reluctantly at first, learning to shoot a bow, getting over being scared to climb a tree, finding hunting clothes that would fit, trusting that body warmers wouldn’t let me freeze to death, getting up at 4:00am, and, building the courage to let an arrow fly. Oh yeah, and getting over the mental thing about eating wild game! That was one of the hardest for me. Now, my idea of a perfect meal these days, Antelope steak on the grill with fried potatoes and onions and corn, that’s it!Today, I can honestly say that some of my most cherished moments with my husband and my boys are when we’re hunting together. I have had the pleasure of harvesting and cooking up white-tailed deer, turkey, antelope and now my first mule deer. 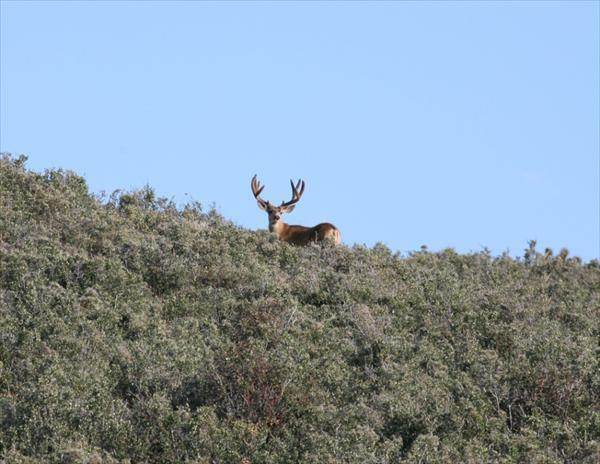 Which brings us to my mule deer story, the reason I sat down to write today. I’ll begin by saying the few days I hunted Northern Colorado with Wes Atkinson, owner of Atkinson Expeditions, were packed full of excitement! Besides obviously coming home with an incredible mule deer buck, we were in the thick of things from the very first moment the hunt began. Let me explain; the thick of things meaning I was at full draw on 2 different mulies - one at 5 yards, a 170 inch whopper with 17+ inch G-2’s (deer stood up with no shot, mahogany bushes covering vitals, then blew), and I was at full draw, 30 yards away from a 300+ bull elk who made my knees so weak I’m still having trouble walking straight! - (again, that darn mahogany, he was supposed to come in below us, he came in above, I had to get around the bush, he busted me!) And there were other close calls to boot. I mean to tell you I was in their world! I’ve come along way from being the resentful wife waiting at home. I have never in my life been that close to such magnificent creatures. Did I mention that this was the first hunt that I did not sit in a blind, but instead chose to spot and stalk these animals? Do I even have to tell you that I will probably never sit another blind? Did I die and go to heaven or what? What an experience it was to climb a mountain, to crawl, to overcome obstacles, one quiet step at a time, to get as close as a human possibly can, to these incredible animals! What a small, but wonderful feeling! Once again, I feel so grateful to Marty for never giving up on me in those early days. 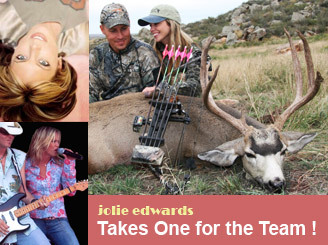 Country Music Singer Jolie Edwards isn't just a talented singer, she's also a mother of two and a dedicated bowhunter. Visit her website to order her CD's and learn more about her. So, with all the close encounters I had, I still had not closed the deal and the clock had run down to the last hour of my hunt. We were supposed to be checked out of our hotel room and on our way back to Nebraska when one last, “slim chance” opportunity arrived. Wes and Marty spotted some deer heading up a ridge to bed for the day; there appeared to be 7 or 8 deer with a couple of possible shooters. We discussed the options, talked about how horrible the conditions were, in fact we all made the comment that this was our worst set up of the whole trip. Not to mention the time crunch. We’d had incredible wind the last 2 days that allowed us to move in very close, but this day there was absolutely zero wind! It was so still and quiet, we thought we would never get close enough, plus if there were 7 or 8 deer think of all the eyes and ears! The side of the mountain that we would have to take is full of mahogany bushes and big boulders, good enough cover I guess, but would we be able to even get through the thick bushes? This was it though, we either made a play or my hunt was over and we headed home. I actually said to Wes, “This is our worst day for conditions, which means it will probably happen”, so with that we headed out. Now, I have forgotten to mention that in these impossible conditions, we have to stalk with no wind and too many deer, we are going to go ahead and try to not just get me close enough, but 4 of us, Wes, Marty, Wes’ wife Rachelle, and yours truly. Why, you may ask? Well, because, I’m not a “hunters widow” anymore, now I choose to “HUNT LIKE A WOMAN”, and I wanted my man and my best friend with me! Rachelle and I have become super close, partly due the fact that we have sat in a Double Bull blind together hunting for somewhere in the neighborhood of 120 hours - something like that. It’s a funny thing; you get pretty close to someone when you’re in solitary confinement with them for that long! Together, we managed, to kill my first P&Y archery antelope in 2006. Rachelle got the whole thing on video and it was just an awesome thing to share together, so I knew she had to be there if something happened. And, guess what, the impossible became possible when Wesley Atkinson got the 4 of us within 20 yards of this beautiful 3×4, 6 1/2 yr old muley! I thought about trying to describe the stalk, but really it’s not describable. I will just say that it was a team effort, holding branches out of the way for each other, handing off my bow to Wes so I could crawl under bushes, lending hands to muscle our way over boulders, I mean it was intense! I wish I would have timed how long it took us - a long time. Wes could not even film any of the stalk like he normally does because it was just too woolly. So, we finally stopped when we thought we might be getting close enough. Wes peeked over the top of a big boulder and spotted some tines sticking up through a mahogany bush. We ranged. Closer than we thought. 20 yards! Marty helped me up and helped me keep my balance on the rock by holding onto my waist. He kept whispering in my ear sweet nothings! No, just kidding, he was whispering “Calm down, slow down, take a breath” my whole body was shaking! Marty said, “When the deer goes to stand, draw your bow and be ready.” Well, I stood like that for probably 10 minutes or so and then it happened! The deer stood, I drew. Once again, there were mahogany bushes covering his vitals. I heard Marty whisper, “Wait, wait” The deer took a couple of steps in our direction, his vitals opened up. Marty said, “If you have a shot take it!” I had the shot so I let ‘er fly, Perfect! Double lunged! We watched the buck go about 60-70 yards and fall. The whole thing took less than 30 seconds. 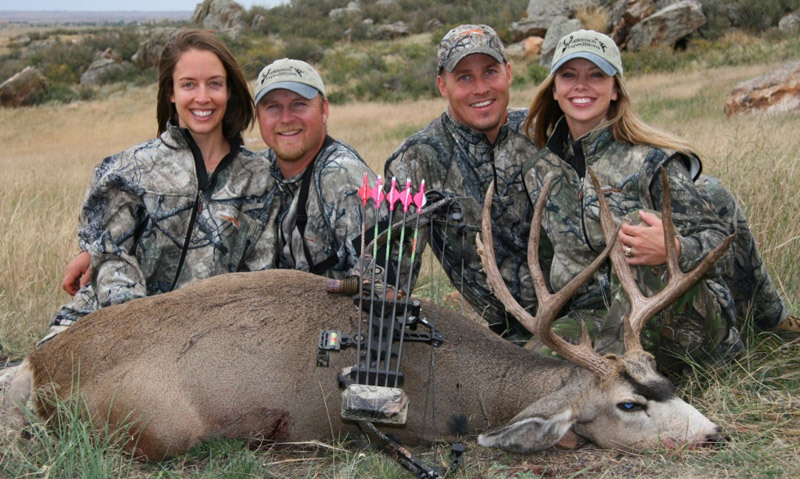 The Team - Rachelle and Wes Atkinson of Atkinson Expeditions and Marty and Jolie Edwards with Jolie's Fantastic Muley! To say that I was overcome with emotion is such an understatement. I always get a little weepy when I shoot something, (HUNT LIKE A WOMAN) but this one really got me. I’m not sure if it was just because it was my first successful stalk. Maybe somehow I felt more like I earned it, or perhaps it was the fact that I was in awe of being so close to these animals for 2 days that it just had a different feel to close the deal. Maybe it had something to do with the whole “team” being there, and getting it done together. Whatever it was, I have to say that I have never in my life had a feeling like I had when I finally got my hands on that gorgeous animal. I cried like never before. I feel sorry for the folks who will never have that feeling, and for a moment I felt sad thinking about all the “hunters’ widows” out there who will never give it a chance. I thanked God for the deer, for the good shot, for the clean kill, for the food, for the gorgeous surroundings, and for my husband and my friends that helped make it happen for me. I sat with my deer for some time, just soaking up the moment and putting my hands on him. I felt so privileged to be in his world and to be so close to him that I could touch his nose. The confused feeling I used to have about Marty respecting, yet killing an animal gets clearer for me with every hunt. It was a Sunday, and I definitely made it to church! I know some may think I get too mushy about my huntin’, I guess I don’t really care. It has taken me a long time to get to this place and I take it pretty seriously when I take an animal’s life. It’s a big responsibility that I will never take lightly. Those who don’t get it, well, I feel sorry for them and I’d offer this advice…. HUNT LIKE A WOMAN! then you’ll “get it”!